The Rev. David Wilson, superintendent of the Oklahoma Indian Missionary Conference, and the Rev. 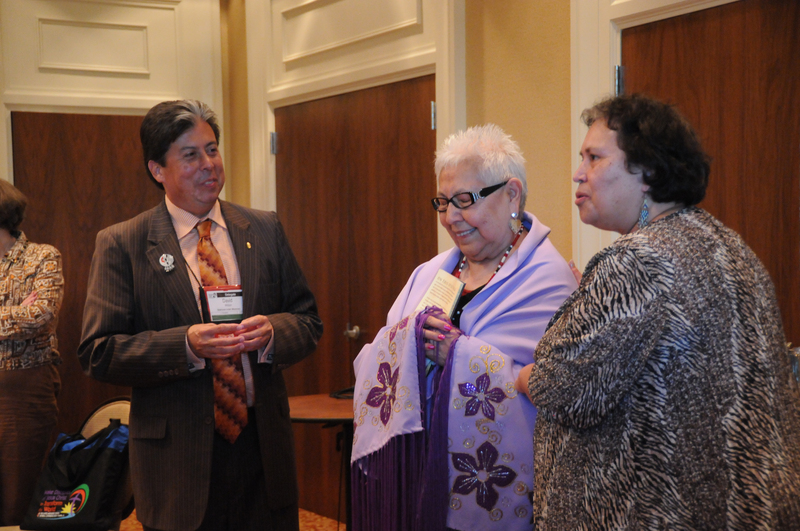 Anita Phillips, executive director of the Native American Comprehensive Plan, present Henrietta Mann, co-editor and lead author of the new book, "On This Spirit Walk," with a shawl during a Native American gathering on April 26 at the 2012 United Methodist General Conference in Tampa, Fla.
Collins-Ball has served the church as an ordained pastor for 12 years, but she's still asking herself, "Where do I fit in the church?" She says it is because she's a woman, but it's also because she is a Native American, a member of the Lumbee tribe. She says she hopes the "Act of Repentance toward Healing Relationships with Indigenous People" service on April 27, during the 2012 General Conference, will help answer that question and pave the way for a church that's more welcoming of Native Americans. Collins-Ball isn't a delegate. Neither are the more than a dozen other Native American United Methodists who made the nearly 10-hour drive from Pembroke, N.C., and nearby cities to Tampa on April 26. They came specifically to attend a dinner sponsored by the Native American Comprehensive Plan that evening and the service Friday. Collins-Ball says her hope and prayer for the service is that afterward things will be done differently "so that I can ensure that when my son decides he's ready to come back to the church, when my grandchild grows up and (says) 'I want to go back to the church where I was baptized' &ellipsis; there's a place for them. I need to hear that." Collins-Ball is pastor at Branch Street United Methodist Church, a downtown, Native American congregation in a small community. She is also leadership coordinator for the Native American Cooperative Ministries of the North Carolina Annual (regional) Conference. After accepting the call to ministry and receiving the blessing of the Native American church, Collins-Ball says her district superintendent told her to wait about a year before going to seminary, that he wasn't sure he would be able to find an appointment for her after ordination because she is Native American and female. She says her conference had a service of repentance three years ago, but "we're still all sitting here at the table trying to figure out what changed." "My prayer," she said, "is this is going to be different. &ellipsis; Because of this larger audience (General Conference), we are all going to feel that this is important. "We need to do this, and we need to ensure that whatever is decided that's going to come out of this is carried out." "I think it's important that we be here, but I don't expect anything to come of this," said the Rev. Deborah Wilkins. Wilkins is a second-career pastor serving at Wesley United Methodist Church in Pembroke and, like Collins-Ball, a member of the Lumbee tribe. She says the service has value in a general sense. "It's valuable for us to participate and to be here," she said, "but how they (delegates) will value it - they will hear, but what difference will it make?" Wilkins said she was inspired to attend after hearing former U.S. Secretary of State Madeleine Albright describe getting in touch with her Jewish roots in light of the Holocaust, while acknowledging that she does not believe in collective guilt. Wilkins is concerned about a sense of denial she sees among Anglos about past atrocities against indigenous people, specifically Native Americans. "I don't know if they want to avoid it or deny it, but there's a sense that they don't want to acknowledge it," she said. "I'm here because I'm native and because I'm a pastor, an ordained elder in the church," she said. "I love my church, and I love my native people." Both Wilkins and Collins-Ball attended the dinner, which honored Henrietta Mann, principal author and editor of "On This Spirit Walk." Mann is a Cheyenne serving as president of the Cheyenne and Arapaho Trail College in Weatherford, Okla. The book includes contributions from Native American United Methodists and is intended as a resource from the Native American Comprehensive Plan for small group study "with the hope it may shed some light on what it means to live life as a native or indigenous person, and why the Act of Repentance is a matter of such great importance to the whole church," wrote the Rev. Anita Phillips in a letter to delegates. Phillips is co-author and editor of the book and executive director of the Native American Comprehensive Plan. Each delegate received a copy. Copies are also available at the Act of Repentance booth in the General Conference exhibit hall. *Parham is a freelance writer, editor and communications consultant based in Apopka, Fla., and serving as part of the United Methodist News Service team at General Conference 2012.